The Basilica Landmark replaced the 1913 steam heating system in the church and school with a highly efficient hot water system. The two old steam boilers were outdated, highly inefficient and required expensive yearly maintenance to ensure they were working properly. This new system provides air conditioning in the school, which had been provided by window air conditioning units. 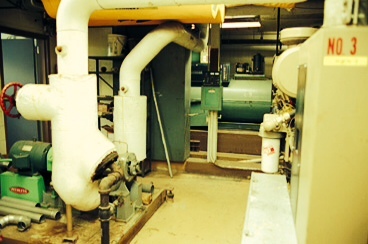 During the spring of 2014, three much smaller (8’ long, 5” high and 34” wide) boilers were installed. The system cycles through so the units are added as more heat is needed. The new hot water condensing boilers continue to provide heat to both the church and school. A new fan coil system that uses forced air hot water has been installed in the school to allow both heating and cooling. The new boilers were brought in through the front of the church at ground level through the Church Undercroft to the underground boiler room, which is west of the School under the parking lot. They will were installed in the boiler room in front of the old boilers. Due to historic reasons and the difficulty in doing so, the old boilers will not be removed. All radiators will be removed in the school and new fan coil units will be installed. In addition, all window air conditioning units will be removed, and no longer used in the School. One of the two 70-ton chillers currently located in the school parking lot was replaced with the new160-ton chiller. The total cost for this project was approximately $1.5 million and improved climate control in the church and school, giving significant cost savings of approximately $13,000 or more. This project started in February of 2014 and was completed in the summer of 2014.